The global industrial protective clothing market features a largely fragmented competitive landscape, with leading companies holding a small share of the overall market, says Transparency Market Research (TMR) in a recent report. The top three vendors in the market, namely Milliken & Company, TenCate, and Aramid collectively accounted for a 27.7% of the overall market in 2015, with small- and medium-sized regional players accounting for the rest. Recently, however, companies in the market have started resorting to consolidations through strategic acquisitions as a way to strengthen their positions in the highly competitive market. Recent instances are the acquisitions by National Safety Apparel. The company acquired DRIFIRE from Optimer Brands in June 2016 and TECHGEN from INVISTA Ashburn Hill LLC in September 2015. TMR estimates that the market will expand at a healthy CAGR of 6.8% from 2016 to 2024, rising from a valuation of US$2.24 bn in 2016 to US$3.36 bn by 2024. The oil and gas industry accounted for a dominant 20% of the overall market for industrial protective clothing fabrics in 2015. With wide-ranging applications spanning a variety of operations, the oil and gas industry is certainly a key contributor to the overall development of the global industrial protective clothing fabrics market. Owing to the recent turmoil in international prices, the oil and gas industry was hit hard and is still struggling to recover from the downturn, with many running projects discontinued and new projects wrapped up. The situation is expected to levy a notable negative impact on the market in the next few years. 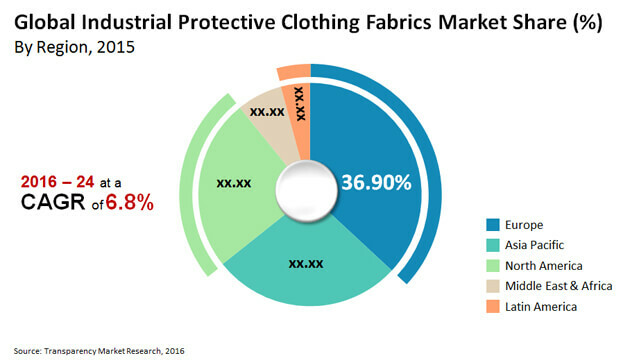 From a geographical standpoint, the Europe market for industrial protective clothing fabrics is presently the dominant regional market, accounting for nearly 37% of the global market. Although the region is expected to lead to healthy growth avenues to the market for industrial protective clothing fabrics in the next few years as well, the Asia Pacific market will lead to the most promising growth opportunities. Industrially advancing countries such as India and China in the region are generating high demand for employee safety products, including industry protective clothing. The rising awareness about the safety of human resources in industries characterized by the handling of or work around hazardous materials and flame, especially across emerging economies such as Asia Pacific, has emerged as the key driver of the global industrial protective clothing fabrics market in the past few years. The workforce in these regions is becoming more organized and is increasingly demanding safety and protection equipment. The thriving growth of industries such as construction, oil and gas, and mining are recruiting an increased number of industrial workers, which will directly lead to an increased need for industrial protective clothing. The fact that the production of industrial protective clothing fabric varieties, such as the flame resistant ones, is an expensive procedure, the costs of industrial protective clothes are also significantly high. This could hamper the uptake of such entities from a number of small- and medium-sized industries as well as from the cost-conscious emerging economies. The cost of these products is, thus, expected to emerge as one of the key factors hampering the global industrial protective clothing fabrics market.